Pre-Algebra Interactive Learning Software | Math Tutor Inc.
software tutorial program for learning and mastering pre-algebra. Students learn the concepts of pre-algebra, build problem-solving skills, and build a solid foundation for further math learning. PRE-ALGEBRA is a dynamic interactive learning program designed for students at all levels of ability. Students receive personalized on-demand coaching and hints as they learn. 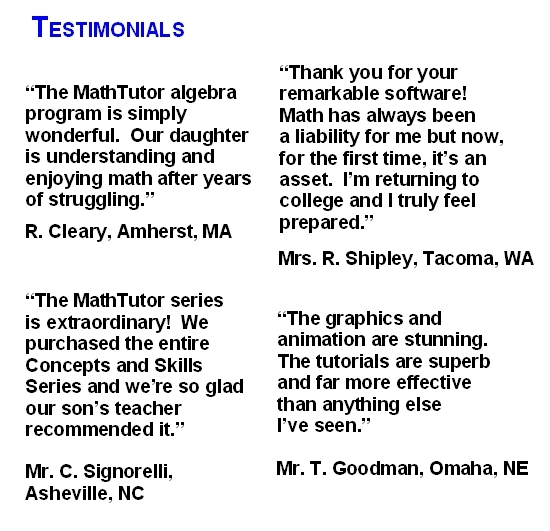 Parents seeking homeschool pre-algebra tutorial and learning software will find the program to be perfectly suited to their needs. PRE-ALGEBRA is research-based and has been acclaimed for its educational excellence as well as its flexibility. It can be used for self-study and to supplement classroom instruction in high school and middle school math classes. The program also contains diagnostic and assessment tests that measure student skills and provide a study plan customized for each student. Designed by math educators and in accordance with math curriculum standards, the program is also effective when used as software for remedial and developmental math teaching. Adding Fractions and Mixed Nos. Subtracting Fractions and Mixed Nos. Multiplying Fractions and Mixed Nos. Dividing Fractions and Mixed Nos. Comparing and Rounding Decimal Nos.